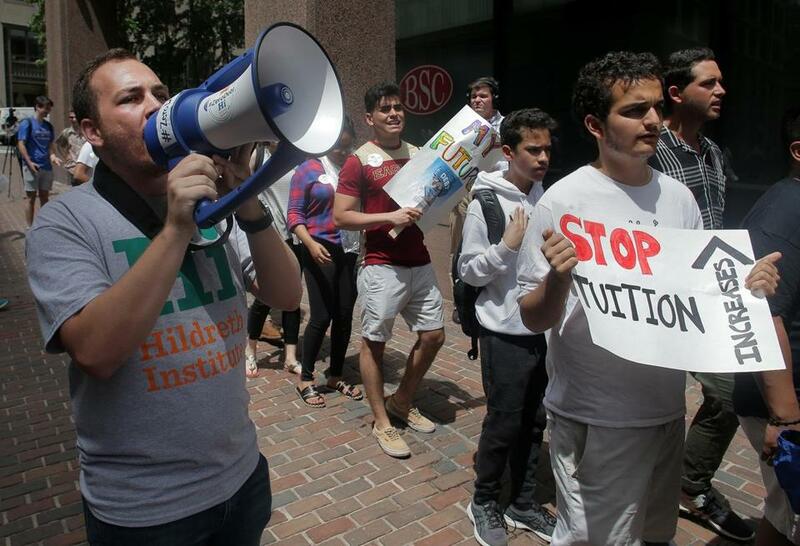 Matt Frentz, the organizing manager at Hildreth Institute, shouted slogans Wednesdayat a protest over rising tuition at the downtown Beacon Street offices of the UMass system. About 40 students and activists marched outside of the University of Massachusetts’ administrative offices Wednesday to protest the recent announcement of a tuition increase across the UMass system. This will be the fifth consecutive year that the system has raised tuition by 2.5 percent. The protest was organized by Hildreth Institute, a nonprofit group that hopes to rally students around the issue of student debt and advocate for zero loans in Massachusetts. “Our goal is, as an institution, to bring a student voice to the table,” said Bahar Akman Imboden, Hildreth’s managing director. Beata Coloyan, Hildreth’s policy and advocacy manager, said the group marched outside of UMass president Martin T. Meehan’s downtown office to highlight a lack of state support for public universities. “We want him more on the side of students and getting his support on pressing the state for more aid,” Coloyan said. Massachusetts is currently ranked as the 36th state in the nation in higher education spending per capita — nearly 16 percent below the average, according to a recent study by the Massachusetts Budget and Policy Center. Leedberg, who is also a student organizer with Hildreth, said she feels especially anxious about the recent increases in tuition because she hopes to attend medical school after she graduates. Tuition rates are expected to increase an average of $351 per student. Across the four UMass undergraduate campuses, the average tuition for in-state students is expected to rise from $14,012 to $14,363. A report by the Massachusetts Budget and Policy Center released in March found that the average student loan debt for graduates of Massachusetts’ public four-year colleges rose faster than any other state in the country except Delaware. Between 2004 and 2016, that figure increased by 77 percent. The report also found that state funding for higher education had fallen by 14 percent since 2001, from $1.4 billion to $1.2 billion, when adjusted for inflation. One of the event’s organizers, Matt Frentz, stood in the middle of the group and led chants through a hand-held megaphone. Gove said he feels especially frustrated with the UMass system in light of the April announcement that UMass Amherst would acquire Mount Ida College’s 75-acre campus for $75 million while the Boston campus has been scrambling to pay for major repairs at its own campus. “You just feel like your voice is small,” he said. Jeff Cournoyer, a spokesman for Meehan, said posted tuition isn’t an accurate portrayal of the cost of attendance because the UMass system meets 90 percent of in-state undergraduate need through financial need. This year, UMass met its goal of keeping tuition increases for in-state students below the rate of inflation, Cournoyer said. “We understand the impact of even small tuition increases on our students and their families, and work hard to hold increases as low as possible,” he said.